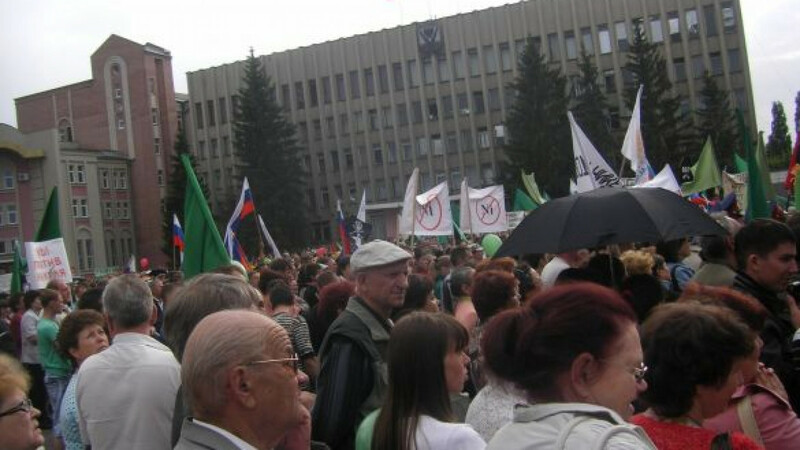 Demonstrators at a protest on June 3 in Borisoglebsk against the development of nickel and copper deposits in the Voronezh region. Norilsk Nickel will not challenge the outcome of a tender it lost to develop nickel and copper deposits in the Voronezh region because of opposition from locals and environmentalists, the metals giant said. "As a socially and environmentally responsible company, Norilsk Nickel has decided not to challenge the results of the recent tender for the Yelanskoye and Yelinskoye nickel-copper field in the Voronezh region," the company said in a statement released Monday. Norilsk Nickel lost a tender to develop the deposits to Ural Metals and Mining Company (UGMK) in May. Earlier it had been reported that Norilsk Nickel had appealed to the Natural Resources and Environment Ministry over the outcome of the tender. Explaining its decision to drop the challenge, the company cited the "consolidated opposition" of local residents and "the alarming claims of environmentalists" opposed to the project. The Yelanskoye and Yelinskoye deposits in the eastern part of the Voronezh region are thought to be the last undeveloped nickel deposits in Europe. They are respectively thought to hold 54,100 and 393,800 tons of the metal, as well as tens of thousands of tons of copper and cobalt. UGMK director of mining Grigory Rudoi said last month that it would take 50 billion rubles ($1.53 billion) to develop the deposits. He said the company plans to finish exploration work by 2016 or 2017 and begin extracting the first metal in 2022. UGMK may abandon the project if nickel falls below $15,000 per ton. The plans have been vigorously contested by environmentalists and local people who fear that mining work could contaminate aquifers and topsoil in the area and threaten a nearby nature reserve. Protests in Borisoglebsk, the town closest to the deposits, Voronezh and the neighboring Volgograd region have attracted as many as 5,000 people in recent months. Responding to the protests last week, Voronezh region Governor Alexei Gordeyev accused unspecified "irresponsible politicians" of turning the "sincere concerns of local residents into a bargaining chip." "[I] will not allow the development of deposits without the support of the local population and social cohesion," he said in comments carried by state-owned Rossiiskaya Gazeta.